Anime-zing! is run by many dedicated individuals who volunteer their time and energy to help make the best convention possible. If you have a question for staff, you should use our contact form if the question is not already answered on our website. If you answered yes to one or more of the above questions, we would love to have you join staff for QC Anime-zing!. Staff members are the ground-floor individuals that make sure the convention runs smoothly. You can help with setup, help with organizing, help with running events, and a whole wide range of other things as a staff member for the convention. What do you get out of it? You can make tons of friends among staff and you get the satisfaction of knowing that you were part of an awesome experience for hundreds of people. That not enough? Staff members get in free and get a small pay, and we randomly give away prizes at staff meetings. Being on staff can be a lot of fun! 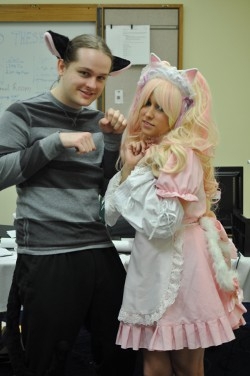 You also have the opportunity to help with, or attend for free, other mini-cons like Anime-SPARK! and Anime-ZAP!